When a fast is just around the corner, the fridge gets stocked with non-dairy creamer and margarine. 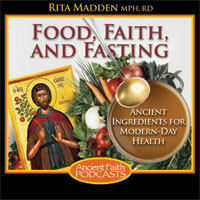 Rita explains how these foods sabotage the very essence of fasting and are detrimental to health. Welcome, everyone, to another session of Food, Faith, and Fasting. What I was hoping we could do in this podcast is get ready for the Great Fast. We are going to look at what we need to do to have a healthy and fruitful fasting season. Fasting is a medicine, but like all medicines, though it be very profitable to the person who knows how to use it, it frequently becomes useless and even harmful in the hands of him who is unskilled in its use. This teaching is taken from St. John Chrysostom, and we’re going to utilize it as we look at what foods should we be stoking our lenten kitchen with. Kind of an ironic statement there: we’re stocking our lenten kitchen. But let’s think about this, because out go the butters the creams, the eggs, the wine, the meats, the fish… what are we going to bring in to the kitchen? A lot of times we see people now bringing in these foreign fake-food concoctions: shortening, margarine, non-dairy creamer—that is an oxymoron in itself—diet soda, and Twizzlers. I mean, you’ll see all sorts of things when it’s time to fast. Remember: we must eat real foods. If you have not had a chance to listen to that podcast, please go back and review that one on what we should be eating. Our body does not have a relationship with margarine, and the ingredients in non-dairy creamer are enough to scare a person. Next time you have a chance, look at the back of a non-dairy creamer, read the ingredients, and tell me if you can pronounce those words or if you can find half of them in a grocery store. Remember the rule: if you can’t pronounce it, if it wasn’t around 300 years ago, if you don’t even know what it is or you couldn’t buy it at a grocery store, you probably shouldn’t be putting it into your mouth. Margarine is a common replacement food we see taking place when we are not using butter. Margarine has been shown to be worse for our health than butter. It has a greater affect on raising our cholesterol levels when compared to saturated fat that is found in meats and bacon and butter and eggs. And it’s also worse for our triglyceride levels. So we don’t need to remove these foods from our diet but replace them with fake foods. If we just replace different foods that have to be removed from our diet when we’re fasting with other foods, we essentially are missing the essence of the blessing of fasting. Fasting must be done with a sincere effort, and it should not be the substitution of one type of food for another. Fasting is going to lead us to experiencing real hunger. This is just the reality of it. We are cutting out a lot of foods from our diets that are very satisfying foods, that contain fat and protein, and we know that those macronutrients alone keep us satisfied for a longer period of time. But not only that, we are focusing on eating less; we are trying to control our between-meals snacking. We’re all fasting at different levels when it comes to those things, because again, back to the quote, if we’re doing it in an unskillful way or we’re trying to do too much too fast, it could actually be harmful to us. I don’t want to spend too much time on that today; we’ll spend some time on that in future podcasts to come. Today we’re focusing on more of the actual food end of it. So, yes, we are going to be experiencing a real hunger, and the reality of it is that we want to experience this hunger. If we’re not experiencing this hunger, we are depriving ourselves of the benefit of fasting opening our soul, our hearts, and our inner being. When we allow ourselves to be open to this hunger, it allows us to be open to God and have greater dependence on him. When we’re in these moments of hunger—and again, it’s a very real thing that’s going to occur, just from the physiology of what’s going on—we have to focus on, God-willing, turning more to prayer in these times of hunger. Now it’s important to mention something here, because when hunger goes up, frustration goes up. So when we feel hungry, we also get frustrated. Blood sugar goes down; irritability goes up. So be aware of that: there are going to be times when you’re going to feel frustrated more. Turn to prayer. You know, it could be easy for us to snap on a co-worker or a spouse or a child or a loved one during these times of fasting. Be aware of that. But again, this hunger is necessary. First and foremost, remind yourself to remove the fake foods from your diet. Do not replace the butter and the half-and-half that you put in your coffee with margarine and non-dairy creamer. Remember: you want to experience the real hunger so that you can have the benefit and the blessing of fasting encompassing you. This practice of fasting was inspired by the Holy Spirit and has been passed down throughout the centuries through Holy Tradition. Fasting leads us to struggle and self-limitation. Again, all of this works together to help us empty ourselves to allow us to make room to be filled with Christ. I should put it like this: while back in the day when the great lenten season, the Great Fast, was upon St. Maximos the Confessor, St. Basil the Great, do you think they were figuring out what food substitutes they could use in their tea, their cakes, or their casseroles? No! The thing is that the removal of certain foods just existed. Now we live in this culture where there are so many foods that are called “foods” that aren’t even foods, and we eat more of them during the lenten season. This is why it pains me: people can actually fast, and it can become more of an unhealthful practice for them, especially if they’re consuming so many of these fake foods. First and foremost, I want you to focus on only choosing real foods during the Great Lenten Fast. Beans, rice, pasta, oats, buckwheat, bread, fruits, vegetables, nuts, seeds—there are many foods out there that we can still eat. I have compiled just a small fasting cookbook with some tips for fasting and also some recipes. Please, if you want a copy of that, send me an email and I’ll gladly send it your way, and hopefully it can help you focus on just eating real foods during the fasting season. A couple other things that I want to point out: and one I briefly touched upon, and that’s the idea that we’re going to experience real hunger. That’s okay, and that’s actually what we want to happen. Recognize that, as a result of this, you may be more tempted, but this struggle is an opportunity for us to grow in love, in patience, in long-suffering, in gratitude. So recognize that and just remind yourself that this is part of what this is all about. Like I said, the fasting is just one component. We look at almsgiving and services. There’s going to be more services at the church. If you can make it more, that’s great! When you’re feeling hungry, and you turn that hunger into prayer, whether it be at a service or in your prayer corner at home or just taking a five-minute break and just clocking out of your workday and having prayer, this is a good thing. This is how this tool of fasting can help us to deepen our prayer life and our walk in faith. Another thing I want you to be very aware of is tempting foods. There are lots of foods out there that are fasting that are quick and snacky foods. Some of them actually, with the marketing strategies, look like they’re actually healthy, right? So we see “vegan granola bars” and “veggie chips” and “soy-based ice cream.” There’s so many different things out there. Other snacky foods might be potato chips or vegan cookies, corn chips, lots of different things that all you need to do is rip open the bag and then you can start eating. But just be aware of the fact that if these foods are in the home and you’re really feeling hungry, it makes it so much easier to start snacking on them. I’m not saying every once in a while to enjoy a snacky food is a bad thing, but again, it’s in its proper context: as long as it’s a real food, and it’s not necessarily a food that’s going to provide us with a ton of nourishment, we need to look at it as a treat food. There’s a time and a place for treat foods. But if these foods are in the home, they could start to work as quick fixes. That bag of chips can develop a voice. You’re sitting in the living room, and all of a sudden you feel that bag of chips calling you to the kitchen. Whatever it might be, recognize that if it’s a tempting food for you, it shouldn’t be in the home at all, especially during fasting seasons when you are going to be feeling a bit more hungry. A little bit more is going to have to go into meal planning, because we want to focus on just eating real foods that are nourishing, but it is going to benefit your overall health and also your fasting experience, through committing to these principles. To sum up: first and foremost, focus only only only on choosing real foods. Remember: you determine that by reading the ingredient list. If the food doesn’t have an ingredient list and you know that it was around 300 years ago, such as a tomato or a coffee bean, well then, there you have it: you know that that is a real food. But if the ingredient list on a prepackaged food sounds like a chemistry project and you don’t know what half the stuff is and the list is longer than your thumb and you could not buy half of the ingredients that are on that list in a grocery store, you probably shouldn’t be putting it into your mouth. So first and foremost: choose real foods. Let go of the non-dairy creamers, the margarines, and the fake-food substitutes that replace the real deal. Next thing: just recognize that you are going to feel more hungry. This is just part of the fasting experience. This experience of real hunger is going to, again, allow us to open ourselves up to God and have a greater dependence on him. So when you’re feeling hungry, just try to remind yourself that, “Oh yeah, this is supposed to help me focus on prayer. It’s supposed to turn me to Christ. I am emptying myself to be filled with Christ and the life of the Holy Spirit, the life of the Church.” But we can’t do that if we are filled with all the other things of the world. Finally, remind yourself to rid your kitchen of tempting foods, tempting, quick, convenience foods like I mentioned: the potato chips, the veggie chips, the soy-based ice cream. I mean anything that can lead you to mindless eating for the wrong reasons. Eating for the wrong reasons is something that we want to remove, essentially at any point in our life, but especially when we’re fasting we need to kind of recognize that we are going to feel more hungry. So if tempting foods are around and easy to access, it puts us in a greater temptation. Just be aware of that, and think about what you need to do to prepare your lenten kitchen. What needs to be removed, and what needs to be brought in to essentially allow you to have a wholesome and healthy diet during these fasting periods? Like I said, if you need some recipes, some ideas for the Great Fast, please just send me an email and I can send you the cookbook. We will continue to explore more aspects of fasting, but I was hoping this podcast could at least get you started to getting your kitchen stocked for the Great Fast. Until next time, embrace the fast, and may God bless you with a blessed lenten season.